In February 2012 in a paper titled, “The Role of Brands in Human Culture” I noted the significance of branding in our world. To illustrate this, we should note that the top 10 global brands (as measured by the Interbrand index) have a combined value of over $432 billion (against their total market capitalisation of $1.7 trillion). That means that 24% of the real economic value of these organisations lies in their brands. Think about that for a moment… That’s $432 billion of real economic value which exists in potentially the most intangible asset of a business, an asset which only exists in people’s minds. Brands are more than just intellectual property, they become the underlying common ethic that affects all aspects of a firm’s activities. In the above paper Philip Kotler (widely regarded as the most influential marketer of all time) notes that, “…An increasingly number of companies see their brand as the platform for running their business. The brand creates an identity for the product and/or company in the marketplace. It requires the company to think deeply about its mission, vision, and values. The company has to work hard at developing the image that it wants customers to have of the offering. The brand must not only convince prospective customers and draw them to the brand but also be deeply believed in by the employees and other stakeholders of the company...” That note about belief is critical. Branding is a psychological entity that manifests economic value and firms of all sizes. 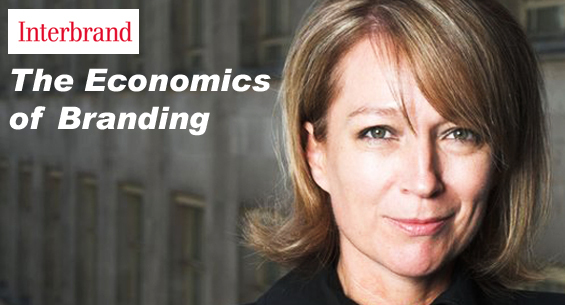 To learn more about the economics of branding, I spoke to Rita Clifton, Chairman of Interbrand London, who are regarded as one of the world’s top branding consultancies and the pioneers of brand valuation. Rita Clifton features regularly on a wide variety of TV and radio programmes on business, brand, marketing and communication issues, including CNN, the Money Programme, BBC Breakfast, Channel 4 News, BBC World Service, the Today programme, The Bottom Line with Evan Davies, Sky News with Jeff Randall, and Radio Five Live. In 2006, she was appointed Visiting Professor at Henley Management College and in 2009 was made President of the Market Research Society. She has also been on the Advisory Board of the Judge Business School at Cambridge University, and on the Business Advisory Board for the Duke of Edinburgh’s Award. She is a Fellow of the Royal Society for Arts and of the Marketing Society, a member of the Marketing Group of Great Britain, the Account Planning Group and the Institute of Practitioners in Advertising. She has chaired several industry committees, including the Code of Advertising Practice to Children. Rita Clifton has been voted one of the 75 Women of Achievement in the fields of advertising, media and marketing over the past 75 years, has been named in the ‘Power 100’ list by Marketing magazine and shortlisted for the Credit Suisse Outstanding Business Woman of the Year. Q: To what extent do you feel brands are responsible for creating value in companies? [Rita Clifton] The starting point is to realise that brand, in whatever type of organisation, is the most important and sustainable asset you’ve got. People may leave or die, buildings may dilapidate or fall down, products and services may become obsolete… The thing that lives on is brand. That is the element which generates long term sustainable value and wealth, and that means you have to manage it… and look after it properly! Looking at how brands create value… Brands create demand and, most importantly, they create secure demand. Some people say their most important asset is people. I would say, “yes but organised to do what?“. If you’re not trying to build a consistent idea, you are just another group of people doing stuff in a sea of other people doing similar stuff. You must assemble and rally people’s efforts in a very particular way that’s going to give you long term competitive advantage. That must live on even if people leave to do other things or- in the most extreme circumstance- pass away. This even applies to tiny companies. If you’re trying to build something that you want to pass on to your children or other members of your family, you need to build a brand. It can’t just be about you and what you’re doing at the moment. If you have a strong brand, that means you have a loyal customer. If you have a loyal customer, that gives you more security of income, earnings and employment. Sometimes people underestimate this important social benefit to brands, let-alone the economic benefits. Q: Do brands create economic values at the country and regional level? [Rita Clifton] If you look at just how many brands the US have got in the top 100 most valuable brands in the world, you will find it’s about 50. This is down from around 65 when Interbrand first started producing the league table, but it’s still an impressive number. American brands have been really important engines for the nation’s success. They have generated secure earnings domestically and in an export context for the US. In terms of exporting ‘American Dream’ brands such as Coca Cola, they have been astonishingly successful. The profits from these activities come back to the US based businesses and are diffused into the economy. China is extremely keen on building brands, even their Vice Premier has made this point clear. You have to remember that China is still theoretically a communist country but even so talks about how important brand and branded commodities are to China’s social and economic progress. China realises that he who owns the brand, owns the wealth… For nations, brands give economic control, security and choice and are therefore extremely important. Q: Have events such as the Arab Spring affected those region’s brands? [Rita Clifton] The issue about the Arab Spring relates to the fact that for businesses to survive, let alone brands, you need a secure and stable base. You need secure economic and social conditions to reduce risk. You need a secure and stable workforce, you need commitment from that workforce, you need absolute consistency and unless you have these stable socio-economic conditions you cannot create the environment in which a brand can grow. There are a lot of positive opportunities emerging from the Arab Spring too as people perceive this as being a region which will gain economic freedom and allow people to create businesses, brands and value in the global marketplace. Countries need economic security and prosperity- that is what creates a more stable and satisfied population. Q: How do you value a brand? [Rita Clifton] We pioneered brand valuation at Interbrand in the 1980s. What became very clear in the mergers and acquisitions climate during that period was that companies were paying an awful lot more for companies they acquired than the tangible book values. Technical accounting practices didn’t really allow for that. The real value of an organisation comes from the value people are prepared to pay for the company itself, or its products and services. Interbrand applies similar principles to robust financial analysts to create the concept of brand valuation. We look at the projected future earnings of a company, and look at the role of brand in generating those earnings, and how secure those earnings are. In some industries the role of brand is very high. For example, in the luxury space more than 70-80% of the value of firms can be attributed to brand. In industries such as petrol retailing the figure is much lower as the product is a commodity and demand is driven by other factors such as convenience and price. We must therefore ensure we weight the earnings calculations to take into account the role that brand plays in generating those earnings. Brand strength is the next component. That is the factor which creates the discount rate. If you have a strong brand, it reduces the risk of your proposition while a weak brand does the opposite. If I was Coca Cola, promising to pay you £1 in 10 years time you would assume I have the power to pay you back…. If I was ‘Smiths’ Cola, or some other unknown company, you may worry if I was going to be there or not. Brand strength calculations are based on ten factors, and give a risk grade which, when applied to the other elements, gives you a net present value for the brand. It’s important to note that brand strength is one of the only dimensions over which a firm has a great amount of control. You can resolve how clear your brand is, how consistently it’s applied across the customer experience, the commitment levels within your organisation, the relevance and a whole host of other factors. You can address each of these to build a strong and secure brand. Q: Has the growth of the internet impacted the economics of branding ? [Rita Clifton] It’s certainly changed the economics of marketing and communications…. What’s very interesting about the digital world is that it has enabled people to know much more about organisations. In the more ‘straightforward‘ broadcast and traditional media worlds, if you invested a lot of money in marketing and communications- these investments would typically be one-way telling consumers about your brand. If you were lucky and they paid attention, they may try your product and buy again if they liked it. The purchase process is now a lot more fluid. Regardless of where you hear about a brand, you may look into it. You may view peer group opinions about that brand and be affected by those views. Don’t forget that people tend to believe peer group opinions more than the company’s own marketing and communications. People regularly tap into conversations about brands and those conversations influence whether or not they purchase. This feedback mechanism can also feedback to the organisation as consumers can let companies know directly whether they did or did not like a given product or brand. Or indeed, whether or not they like the company’s behaviour in the round. The upshot of all this is that if you have a great brand that does what it says it’s going to do and really does deliver authentically, you can spread quickly without spending huge amounts of money on public advertising. Google is a great example. In the old world of brands, you may have been successful in one country and then you would set-up maybe a factory in another country and start marketing there to get distribution and so on. You would have to grow country by country, which would take a while. Google went from a boy’s bedroom idea to a top 10 global brand within 10 years. This growth obviously required enormous effort and investment, but so much of its original success was word of mouth about a breakthrough product . Google had to create a great product, and a great brand around it. It wasn’t just a bigger search engine… it was clear, simple and charming against a backdrop- at the time- of a very messy internet. Facebook are on the same journey- creating a great product and then tapping into a global community. There are risks attached to this, especially if you are in a competitive sector. The digital world has created lots of opportunities, but has also created astonishing speed and scale. You can destroy a brand’s reputation at a speed that can take your breath away. 20 years ago, if you had an environmental problem in some obscure country around the world- you had a while to repair the damage and hope that not too many people found out. In this era of digital-activism, the ghosts of corporate skulduggery never get laid to rest. If you do something bad…. exploit a workforce… have an environmental disaster…. the news of these events can spread rapidly. It takes a long time to build a reputation and trust, and it only takes an instant to lose it. Q: Has the digital world changed the nature of intellectual property? [Rita Clifton] IP is always a challenge when you’re dealing with global markets. Some countries have different standards applied to intellectual property than others, and in some parts of the world there are problems with counterfeiting and copying. What you find in these cases is that countries who engage in these activities… when they start to invent things for themselves they suddenly they get interested in protecting IP! This has also been a commercial challenge through all eras of business, you only have to look at the punch-ups between Google and the publishing industry, YouTube and the film industry and similar cases to see this in action. The difference now is that these challenges are more widespread. Q: What is the impact of corporate social responsibility and philanthropy on a brand? [Rita Clifton] Particularly when measuring brand strength, we find that corporate social responsibility has an effect. In terms of risk, if you’re not responsible, and are not behaving in a way to promote trust, it puts your brand strength score at risk. This particularly affects dimensions like commitment. If you are not behaving well as an organisation, then the commitment of your people may wane- introducing risks into your brand. If you think also about consistency… If your brand promises to behave in a certain way and doesn’t, then your consistency score will reduce. If you are a good corporate citizen, your people are more likely to be committed and you are more likely to be relevant to your consumers. If you have a reputation to protect, you are likely to do the right thing. Your reputation is a critical indicator of whether you can generate long term sustainable value. If you damage your reputation your short and long term prospects will be adversely affected. Our research suggests that 2% of consumer choice can be explained just by corporate citizenship factors, it’s even higher in the business to business sector. This may seem like a small number, but in today’s highly competitive marketplaces, it’s certainly worth having. Q: What makes a great brand? [Rita Clifton] The first and foremost in my view is that you must be clear. If you’re not clear about what your brand stands for, how that’s different and better from the competition now and in the future, you’ve got an issue. This clarity of proposition has to be shared throughout your organisation so that your people know how to make the company successful and make their jobs more secure. Secondly, you must be consistent in everything you do. That doesn’t just mean having the same logo on everything. It also means behavioural consistency. How are you building the clear idea and entire customer experience together as a team? There’s no use pretending you are a smiley customer service oriented organisation when the reality is that you’re an axe-murdering culture on the inside. You need to make sure all parts of your operations work coherently with your brand. The third area is leadership. This obviously is linked to who runs the company or who is seen to be in that role. If you look at Steve Jobs, he was an amazing leader. He epitomised the brand… clear, stylish and absolutely about humanising technology… making sure technology worked for people! Leadership is also about restlessness, innovation and setting your agenda in your markets. This is very closely correlated with long-term value. There is no doubt that brands are important and always have been. Branding, itself, is not a new phenomenon, but our understanding of what branding means is changing. The astonishing growth in communications, media and information technology has meant that our understanding of brands has moved very quickly from being “brands are just a logo” to “brands are everything“. We now understand that brands are wealth creating, wealth defending and immortal. They are emotional and cultural – and represent the point at which the deepest recesses of our psyche connect with the entity being branded (whether that is an individual, a company or even a country). For us as consumers, brands are no less important. They help us make sense of our environment, and build real tangible bonds with the world around us. The smartest firms are the ones who understand these profound facts and build branding into the very heart of their proposition from the very first day they open for business.